The notion of vanua is the epitome of Pacific identity. In the Fijian context, the multiple interpretations of vanua include the land, the environment, the community, or the cultural and social system in which people are integrated. The vanua offers a sense of belonging, blessing, and pride to its people. It is home to knowledge, belief systems, values, and collective identity. It is respected as sacred, safeguarded, and valued. Thus, to enter a new vanua or space with people in it, protocols must be respected and adhered to. Disregarding this is a sign of disrespect and an insult to the stewards of the vanua. The Methodist Church, as the first Christian religion to arrive in Fiji in the 1830s, is held with high regard in most traditional and indigenous communities. Historically, when the first Methodist missionaries arrived, they converted chiefs, and their subjects followed. Since then, the Methodist Church has been closely associated with the vanua, and to separate the two is considered dishonorable. It is one reason Adventism is absent in traditional spaces today. The beliefs and practices of the Seventh-day Adventist Church are not always aligned with the traditions of the vanua. Adventism arrived in Fiji in 1891, about 60 years after Methodism entered the country. The Advent message spread quickly, but not always to the hearts of the country’s chiefs. On the island of Bau, Fiji’s site of dominant power before it was ceded to Great Britain, attempts to introduce Adventism have been difficult. To date, there is no Adventist church on this once powerful island. Just as John I. Tay, J. E. Fulton, and the pioneer missionaries to Fiji had the vision and passion for sharing the Adventist light in challenging environments, so do today’s frontline missionaries in their effort to share the Advent message on Bau. Missionaries to the island consist of a group of dedicated, retired, and unemployed individuals who, in their pursuit to break through to people in the community, go through a series of personal ministry training and practice events immersed in prayer and fasting. Tevita and his wife, Tima, moved from Bau Island to Taro to do house-sitting at an aunt’s home. While living on Taro, Tevita met two missionaries and asked them to visit his home. He shared with them the struggles he and his wife were going through. Tevita is a military officer. After years of merry-making and partying, his wife fell very ill, and she was frequently admitted to hospital. “At this point, I was desperate and started praying, asking God to heal my ill-struck wife,” he said. “My two kids are still very young, and I cannot deal with losing my wife.” The couple started praying, and they worshipped at home on Sundays, committing themselves to God and expecting that, through these efforts, Tima would recover and live. However, she was still very ill. She was so ill that the couple decided to make a deal with God: if He healed Tima, they would follow whichever church God intended for them. Taro is about an hour-and-a-half bus ride from Suva. The sacrifice and dedication that Tevita saw in the missionaries convinced him of their faith. He undertook a series of Bible studies and was baptized into the Seventh-day Adventist Church during a July harvest program. Today, Tevita’s wife is in good health, and both have become frontline missionaries. They desire to be beacons of light in a predominantly Wesleyan environment. Their goal is to take the gospel to the island of Bau, and Tevita’s vision is that one day soon, an Adventist church will be established on the island. 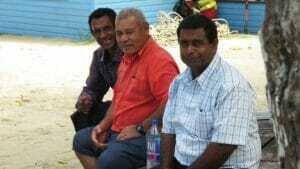 Tevita is certain that God has called his family to take the faith to Bau, and he is aware that traditional protocol will have to be followed. He also recognizes his traditional lineage in the island as tuinidau or guardians and protectors of the island’s natural resources. “It is the link that God can use to have the Adventist message enter Bau,” he said.